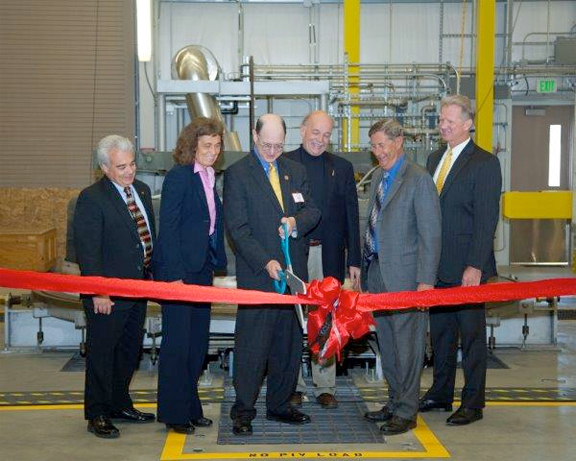 [Satnews] Aerojet Rocketdyne, a subsidiary of Aerojet Rocketdyne Holdings, Inc. (NYSE: AJRD), hosted a ribbon cutting ceremony on November 6 that was attended by more than 300 people, including local dignitaries, suppliers, customers, company leaders and employees. The event celebrated the company’s completion of a $140 million infrastructure improvement project that has increased operating efficiency, reduced costs and positioned the company to bring new programs to the Los Angeles facility. The Los Angeles site is Aerojet Rocketdyne’s center of excellence for large liquid rocket engines, where it currently manufactures the RS-68 engine components for United Launch Alliance’s Delta IV launch vehicle; adapts the RS-25 engine for the Space Launch System, America’s next generation heavy lift launch vehicle; builds missile defense propulsion; and most recently, it has become the design center for the AR1 engine, which the company is developing to replace the Russian-made RD-180 engine on the Atlas V launch vehicle. Ribbon cutting ceremony photo is courtesy of Aerojet Rocketdyne. The RS-25 and AR1 engines are examples of capitalizing on proven, heritage systems to enable space exploration for generations to come and answer the urgent needs of national security. Aerojet Rocketdyne has been working on the RS-25 engines since they originally flew on the space shuttle. Four of these engines will fly at the base of the core stage for the Space Launch System, which is the rocket that will eventually take humans to Mars. The company is also currently building the AR1 engine to address the nation’s need to end the country’s reliance on Russia to launch national security space assets. The AR1 is the logical choice to minimize risk, cost and address the schedule needs of the country to have an American engine ready for 2019.